UPDATE, Feb. 15, 2018: Amazon is pulling out of plans to build half of its new second headquarters (HQ2) in New York City, citing opposition from state and local lawmakers to a deal that would give the company some $3 billion in subsidies. The e-commerce giant said it will not reopen its search for a new location at this time, instead moving ahead with its plans to expand in Northern Virginia and Nashville, Tennessee. New York City’s colleges and universities were leveraged as a draw for Amazon, but some local students and activists felt the city should be spending on its education infrastructure instead of offering billion-dollar incentives to the company. UPDATE, Nov. 13, 2018: Amazon has officially named Long Island City, in Queens, New York, and Arlington, Virginia, as the homes of its new headquarters, according to a company press release. The move gives the company access to the higher education networks of New York City and Washington, D.C. It expects to begin hiring in both locations in 2019. Representatives of both cities said local colleges and universities would benefit from their proximity to the new offices, which plan to hire around 25,000 employees each, many in the tech fields. E-commerce giant Amazon announced late in the bidding and selection process that it planned to divide its second headquarters, dubbed "HQ2", between two cities with each hosting 25,000 employees, according to The Wall Street Journal. The decision, which was a surprise following a much-hyped selection process, was spurred by the desire to recruit top tech talent while managing housing supply, transportation capacity and other challenges resulting from the expected population surge of workers. The company factored access to colleges and universities for recruiting heavily into the selection process. Some colleges are already responding. Virginia Tech today formally announced plans to build a $1 billion, 1-million-square-foot tech-focused graduate campus in Alexandria, Virginia, near the future site of the Virginia headquarters. As host regions to Amazon's planned additional headquarters, New York City and the District of Columbia will need to support demand for tens of thousands of workers, with many in tech fields. Amazon knew that access to 50,000 employees would be a challenge for its HQ2 host, and so it focused on cities and regions with strong networks of colleges and universities from which it could recruit, The Journal reported. The publication also noted prospective host cities included college officials in meetings with Amazon's economic development team, which reviewed the SAT and ACT scores of local high school students to help determine whether a market could supply enough talent. Colleges were in on their cities' bids to woo Amazon, too. The greater Washington and New York City metro areas come with several bona fides, including a strong higher education sector, a highly educated workforce and a public transportation infrastructure that can (mostly) get workers where they need to go. The DC area offers a network of public and private universities, including the University of Maryland, which boasts a highly ranked computer science program, as well as Georgetown University, George Washington University, American University, George Mason University and the University of the District of Columbia. It's also home to Howard University, a top-ranked HBCU. The District of Columbia and Montgomery County, Maryland, each put in their own bids, which made the shortlist (below). However, Government Executive predicted before the announcement that the already tight market for tech sector workers employed by the region's bevy of government contractors will only get tighter if Amazon comes to town. 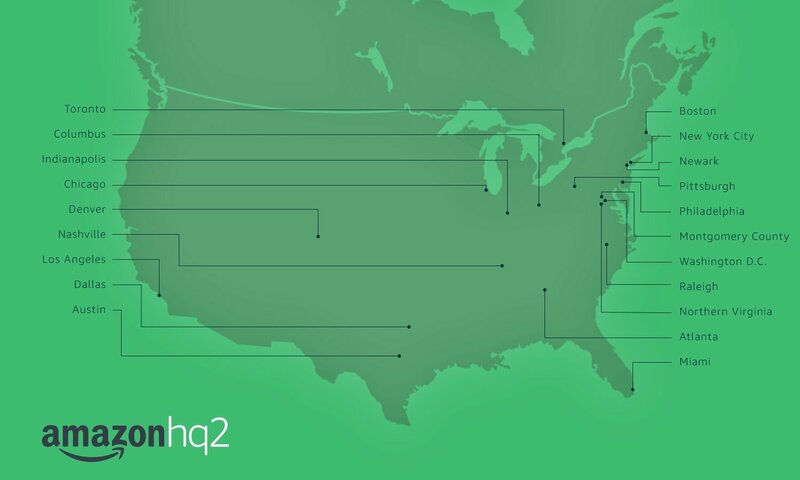 A shortlist of the top 20 candidates for Amazon's HQ2. New York City, too, has a strong roster of nearby colleges and universities from which Amazon could recruit. New York University, Columbia University and the City University of New York system are some of the top educators in the region. The company is also likely to benefit from proximity to Cornell Tech, an effort by the Ithaca, New York-based university to create an interdisciplinary engineering campus in New York City. Amazon already has a strong hand in postsecondary instruction, with efforts to strengthen students' and colleges' competencies in fields such as voice technology and cloud computing by funding research and developing curriculum. It also helped the University of Washington, which shares its hometown of Seattle, expand its Computer Science and Engineering program with a $10 million gift for a new 130,000-square-foot building. Yet even with plans to incentivize universities to help build the local workforce it needs, change won’t come quickly. Though the National Center for Education Statistics reports the number of degrees conferred in the fields of computer and information sciences as well as engineering and engineering technologies are climbing, the growth isn't happening fast enough to keep up with workforce demand, according to The Journal. Amazon wouldn't be the only major employer to struggle to compete for workers locally. Earlier this year, Taiwanese electronics maker Foxconn gifted the University of Wisconsin-Madison $100 million for engineering and innovation research, which included the creation of a research center near its forthcoming $10 billion plant located 100 miles from campus. The company hopes the program will serve up a pool of trained and eligible talent at a time when the state's low unemployment rate makes finding workers a challenge.